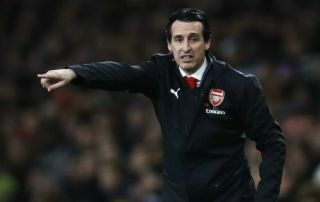 Arsenal have named their team to take on Vorskla Poltava in the Europa League this evening, with manager Unai Emery going for a much-changed side. While a few youngsters and squad players are in the line up, some fans are also taking issue with Carl Jenkinson playing at centre-back and Aaron Ramsey looking like starting out wide. This is not a particularly important game for the Gunners as they are already through to the next round of the Europa League, but there is some amusement from supporters on Twitter right now as what looks like a bizarre mix of players and a strange team. It remains to be seen if this youthful-looking Arsenal side can get a result in tonight’s game, but fans don’t seem to be expecting too much from this crop of players. Full debut for Nketiah & Willock. Pure banter from Emery when he playing Jenko at CB rather than Lichtsteiner.